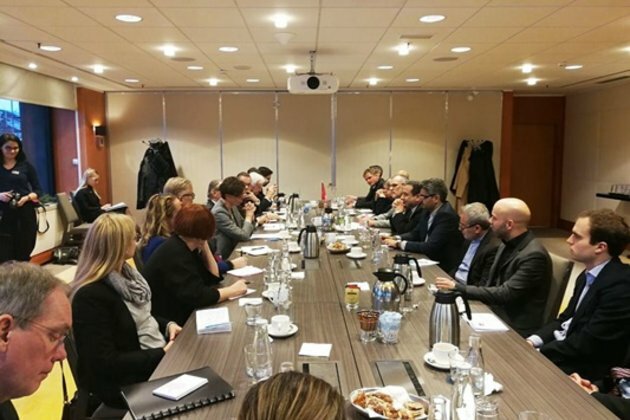 Iranian Deputy Foreign Minister for Political Affairs Seyyed Abbas Araqchi on Wednesday had separate talks with a number of Swedish officials in Stockholm. Araqchi, who is in the Swedish capital to attend the fourth round of Iran-Sweden political consultations, met with Swedish Foreign Minister Margot Wallstrm, his opposite number Annika Soder, and Chairman of the Foreign Policy Committee of Swedens Parliament Hans Wallmark. In the meeting, Wallstrm underlined her countrys political determination to sustain and promote consultations, cooperation and interaction between Tehran and Stockholm on different fronts, including bilateral, regional and international issues. She said the Iran nuclear deal (known as the Joint Comprehensive Plan of Action or the JCPOA) is an international agreement based on multilateralism, and that its implementation has benefited all countries. Therefore, she added, European countries, including Sweden, are set to implement the JCPOA despite the United States withdrawal from the agreement, and seek to make arrangements to maintain and enhance economic and trade activities with Iran. The Swedish diplomacy chief thanked Iran for showing goodwill and backing intra-Yemeni talks held recently in Sweden, and highlighted the necessity of Tehrans continued support and cooperation. Araqchi, in turn, expressed gratitude for Swedens positive and constructive stances in a bid to further promote partnership and interactions with Iran and its active support for the JCPOA. He stressed the need for European countries to show further practical support for the Iran nuclear deal. Araqchi touched upon the outcome of intra-Yemeni negotiations, saying the Islamic Republic of Irans regional policy has always been based on engagement aimed at boosting stability, security, development and political trends. He said Iran will continue to play a constructive role to help make intra-Yemeni talks bear fruit. In five hours of political consultations, Araqchi and Soder also exchanged views on the latest developments in reciprocal ties, the JCPOA and regional issues. They underscored the need for interaction and dialogue in a bid to reach common understanding. The Iranian official also had a meeting with Wallmark where the two sides stressed the need for the promotion of mutual cooperation in various areas, especially the parliamentary domain. Araqchi also attended a meeting of the Stockholm International Peace Research Institute (SIPRI) where elaborated on Tehrans position on the JCPOA. He also answered the questions raised by the participants.